Main gate is on junction of Hospital Bridge Road and Percy Road. Rear entrance/exit is on Hospital Bridge Road. * Includes all public holidays, Christmas and New Year. 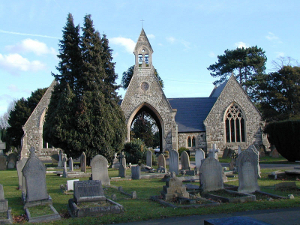 Twickenham Cemetery Chapel is available to people of all faiths, for funeral or memorial services. 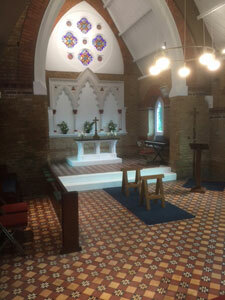 The cemetery chapel seats approximately 50 people, and there is room for about 20 people to stand. An electronic keyboard is provided, and there are CD facilities. An induction loop system has also been fitted. If you are attending a funeral by car, please park inside the cemetery gates and wait for the cortege to pass. You can then drive through, following the cortege to the graveside. If there is a service in the Chapel before the burial, please park on the roads around the chapel building, making sure that the entrance to the chapel is kept clear for the funeral cars. 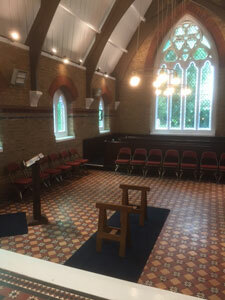 A wheelchair is available within the Chapel if required, and there is pushchair/wheelchair access. If you have found a person using our Burial Registers Search, and would like to visit the grave/s, you can download a map of the cemetery. As the cemetery is quite large, you may wish to purchase a section plan for a small fee which will help you to find the exact grave.